It's a grim thought. One that seems to be imminently more likely today since good ole American values simply don't include conservation of fossil fuel resources and a reduction in global warming. Antagonising Middle Eastern countries doesn't help either. Millions of massive SUVs rumbling around the shopping malls sucking fuel in raptor-like gulps is clearly not the future, you don't need to be Einstein to work that one out. Escalating fuel prices, taxation and servicing costs all contribute to a firmer grip on our motorcycling expenses here in humble Blighty too. 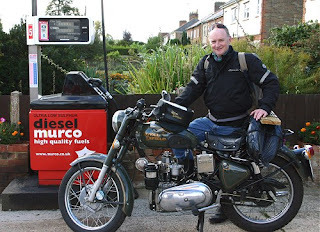 One such extreme solution to ever increasing petrol prices or sudden fuel shortages is the motorcycle owned by seasoned London commuter, David Wareham. 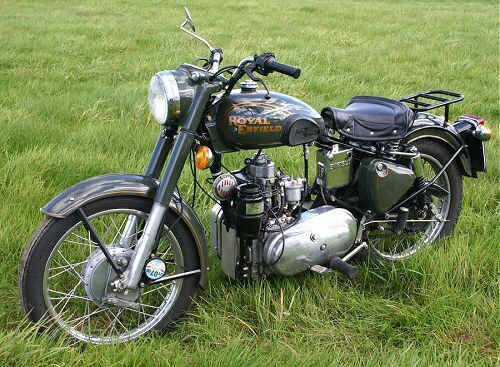 David's new motorcycle is a variant of the famous and much loved Royal Enfield Bullet. I won't go into all the history of the marque and detail how this fifty year old motorcycle design is bizarrely still being produced today in India as a cheap and cheerful form of family transport and also exported worldwide as 'an old classic but built yesterday' choice for many silver-haired riders. What I will point out is that this example carries a 1965 number plate and is registered as such yet is no longer powered by that very attractive but simple Redditch power unit of 350cc or 500cc. 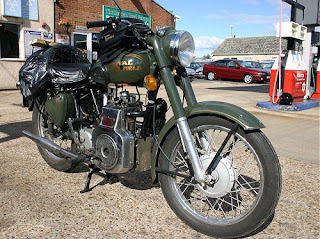 Provided by F2 Motorcycles (www.f2motorcycles.ltd.uk) in Banbury these bikes are created from 1960's Enfields that are restored and modified for diesel power. There are numerous other diesel-powered new Indian Enfield models, most of which are converted in Germany using Hatz power units but as far as I am aware the F2 models are the only historic taxation class motorcycles that are converted to diesel power. A real classic. More importantly to the budget-conscious commuter they are also approximately half the cost of some of the German offerings. Interested? Two different power options are available based on the Greaves diesel motor, the kind of engine more likely to be seen powering a cement mixer on a third world building site. The first option is the 325cc, 6.5hp at 3600rpm unit which is kickstart and not too happily married to the standard four-speed gearbox. This has the benefit of being easier to kickstart but has a very low cruising speed of 40mph. The subject of this test ride though was the 'deluxe' model fitted with the larger whopping 436cc engine with 5-speed gearbox that puts out a heady 7.5hp and which has a maximum speed of just 55mph. To put these figures into perspective, a 500cc petrol-engined Indian Enfield can output approximately three times as much power. So, that old chestnut, what does it ride like? Well, starting is a little more of a ritual than with an average old chuffer but no wicker men, blessed virgins or indeed any pagan chants are required. A decompressor lever needs to be selected and the kickstart slowly pressed down until the decompressor lever clicks back. You are now ready to take the mother of all kicks on the kickstart with every bit of power you can muster from your loins. A decisive swing is needed as the machine can sense hesitation, fear or simply a feeble lightweight at the controls; someone should certainly nickname this bike Excalibur but I'm sure this is its own way of deciding whether you are worthy to ride it. Once running it indeed makes quite a pleasant, noble chuffing sound. You do need to wait a while for the motor to warm up; this is a good time to go make that well deserved cup of tea to refresh you from all that kicking for England. Pre-ride checks: ignition is switched on (the motor will start without the ignition and can easily be forgotten thus preventing the brake light and indicators from functioning); clutch action tested OK and is wonderfully light and easy to use and -- uniquely for an older Enfield -- doesn't appear to overheat in traffic either. Prod the right hand side gear lever gently and it slickly selects first gear, clutch out and we are off. Now, this is when you quickly learn how very different this diesel motor is to the standard petrol fitment. The Greaves diesel motor doesn't really have any useful throttle range; its power is all placed around a very narrow band of revs. It has very good low down torque so is swift away, then microseconds later you need to change up a gear and then again and again and so forth. This quick navigation up the gearbox is a bit of a bind when it takes all five gears to move the plot up to 30mph! However, once in top gear everything is relaxed and the motorcycle no longer requires any input from you, and gentle bimbling along the road is achieved in quite a pleasant fashion. More than that, it's a very comfortable fashion with the leather sprung solo seat and swinging arm damped suspension isolating you from any irregularities in the road surface. Riding along at 40mph is stress-free, even on this brand new bike with just 500 miles on the clock and still with a fairly tight motor. I could now concentrate on the handling, noting that all the weight seems to be planted very low down in the frame making for a very sure and safe ride. Riding along at such gentle speeds you find yourself working out just how cheap it would be to ride around the whole of the country or indeed the whole wide world. With very little to go wrong, no electrics to worry about and in times of crisis when diesel fuel is scarce the option of being able to top up with Asda's finest vegetable oil at 42 pence a litre is a lifesaver (government duty paid retrospectively of course). Running on vegetable oil works out at an equivalent petrol cost of 500 miles to the gallon. It seems it would make good sense making friends with the local MacDonald's manager for used chip fat. Since the throttle is pretty much obsolete, an additional hand lever throttle could make good sense to use as a cruise control, rather like a tractor, ok I had to mention the T word, sorry. One good innovation that this bike's owner is designing is a CVT automatic transmission, based on the Comet design. This would suit the bike perfectly, turning it into an ideal twist 'n' go traffic beater. Unfortunately, or maybe not, the kickstart would no longer be available so a recoil starter or electric start would need to be fitted. This is what I think the motorcycle is crying out for and would transform the riding experience by removing the manic gear changing. 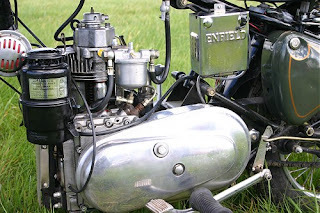 I think though it's more a case of switching your mind over to a pre-war mentality and accepting that your journey time and direction would need adjusting to suit the pace of the diesel Enfield. The Bullet has heaps of character and presence. 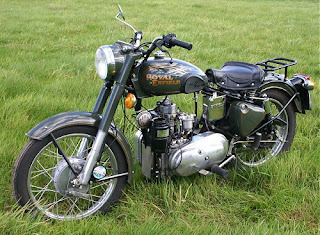 Being a 1965-registered bike gives the bike an added classic bonus, whilst the odd but interesting looking motor soon draws a crowd. I can imagine the owner must spend large amounts of time answering questions to eager people about fuel consumption, speed and how it rides. So after a short but very pleasant ride in Essex I returned the bike and fully understood the thinking behind this bike's purchase. It is an alternative, a viable one at that. It will offer simply gigantic mile crunching travel on pathetic little amounts of fuel, some of which is 'free'. No longer are you reliant on Middle Eastern politics, the whims of Gordon Brown or the mood of truckers blockading oil refineries for the means to your transport. 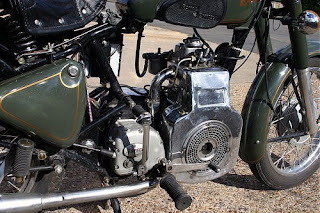 Furthermore, there are no oil filters and no air filter as it uses an oil bath system so servicing costs are just diesel engine oil and the very low Indian Enfield cycle spares costs. The Greaves diesel motor is used in all kinds of industrial implementations so spare parts are easily available if needed, though it is quite usual for industrial diesel motors like this to run practically forever, even neglected. But more than all of this, or as a bonus to others viewing the bike as simply cheap transport, it feels like riding a vintage bike with its simplicity, individual exhaust tone and restful plodding that goes with bikes of a previous age. If we keep going the way we are going and continue to disregard our wasteful use of fuel then perhaps one day we may all be considering a similarly-fuelled motorcycle out of necessity rather than choice. It really is as cheap as chips.